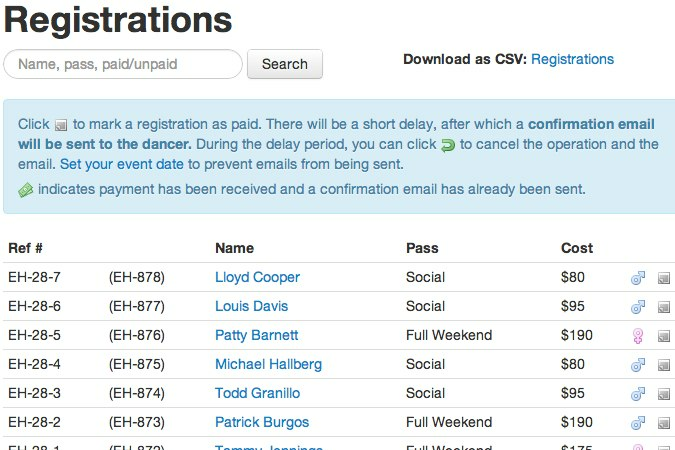 Eventhand helps you run your swing dancing event. 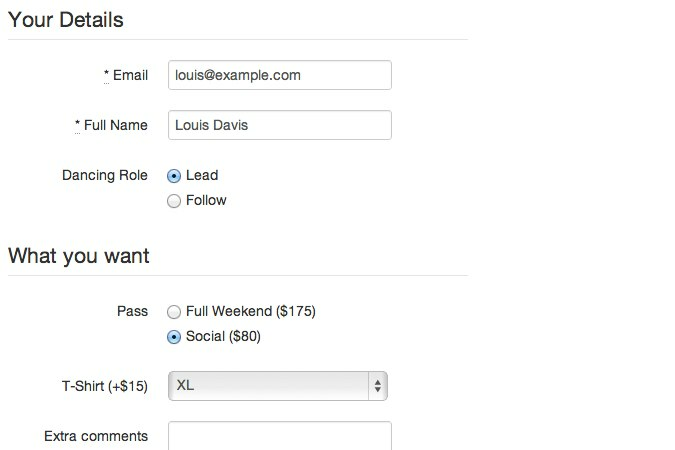 Eventhand provides a customizable registration form that you can link to directly, or embed on your own site. Track registrations, revenue, hosting, merchandise sales, lead/follow ratios, and more. Whether you're running a one night social event, to a full weekend exchange. Spend less time organising and more dancing! Eventhand charges a 2% fee on each registration. I will send you an invoice after your event. For example, say you collect 50 registrations for $100 and 25 registrations for $200. Dancers will pay you $10,000 (50 × 100 + 25 × 200). 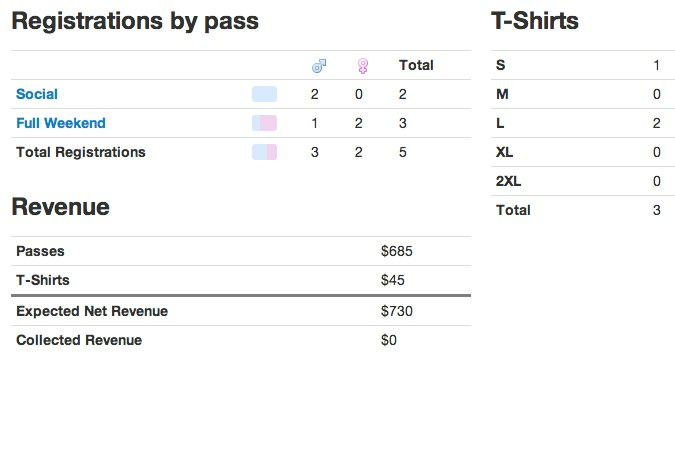 Eventhand will send you an invoice for $200 after your event is complete, and after you have collected all your money. This means you can signup and play with Eventhand for free — you never have to pay anything until after you run an event. The email address you sign up with (as an organiser) will be used to contact you to make sure your event is running smoothly, to send you an invoice, and to notify you of any major updates to Eventhand. The email address supplied by dancers will only be used to send them automated emails about their registration. This list of addresses (for your event) is also provided to you in case you need to contact them. All of your data is available for you to download as a CSV file whenever you like. Eventhand is hosted by an industry leading company (Heroku) that go to great lengths to backup their data. I'm a dancer. From Melbourne, Australia, I mostly dance blues, balboa and the lindy hop. I've been to my fair share of festivals, and I've seen the effort that organisers like you put into them. I want to make your life easier, which is why I made Eventhand. Please drop me a line if you'd like a chat!